I can only confirm what others have said about CG on here, they really do know their stuff, but it's the friendly attitude and passion about what they do that makes the experience all the more satisfying and you know you are in good hands. Both Peter and Chris go out of their way to explain exactly what they do and what can be achieved. I was well looked after by Peter, starting with a test drive on a route they know well, Peter confirmed straight away that my car was not behaving quite as it should. The steering feel hasn't been what it used to be, but I guess over a period of time it's hard to pinpoint, particularly if you don't have experience of driving other 911's! Back at the workshop Peter got busy dismantling the suspension whilst I make myself at home in the office/reception with a tv, kettle and my laptop to catch up on a little work! You are welcome to pop into the workshop any time and the office has a great view of what's going on. There is a fair amount of work to replace all the components I had bought, lower control arms all round, front diagonals, top mounts/bearings, drop links and inner tie rods & track rod ends! Luckily, the only things that needed doing that I hadn't bought with me were front anti-roll bar bushes that Peter ordered from Porsche and delivered on the Friday morning. My top mounts were shot, front control arms not great and n/s inner tie rod was the worst Peter had seen explaining the nadgery handling over bumpy surfaces. By the end of Thursday Peter had the Ohlins built and fitted and nearly all the other bits on the car, leaving Friday for the set-up, corner weighting and full geo. My car was already quite low at the front, probably down to tired springs, 119mm front axle height so 14mm lower than it came out the factory, rear was pretty much spot on. You can have pretty much any height dialled in with the Ohlins, I wanted to drop the car by around 20mm, I already scrape over speed bumps so this seemed a good compromise. 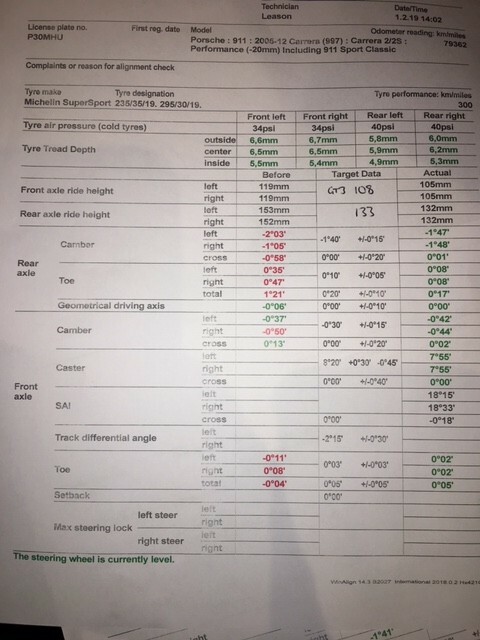 As there is limited camber adjustment, none on the front, any lower and Peter explained tyre wear would suffer. We ended up with 105mm at the front (28mm drop) and 133mm at the rear (20mm drop). Pretty much a the same as a GT3 ((108/133). Overall I am over the moon with how the car feels now, cannot fault the the service and hospitality form Pete and Chris (Holly and Jayne too), in my opinion fantasic value, they didn't even charge me for the courtesy car as I was only staying a mile down the road. What sort of money were the Ohlins & full geo if you don't mind me asking please? Could be my next mod. Nice write up... all sounds very familiar! I bought the Ohlins from Design911, with their seasonal discount they were the cheapest anywhere in the UK, about £2,200! I think CG estimate around 6 hours for a full geo at £75/h+VAT! If you give them a call or drop them a line they will give you a good idea of what expect. Good news Rob, glad it was a good experience. I'm due back there in a few weeks, I will try to persuade them to move 150 miles nearer to me on the south coast (joking)! Luckily only an hour from where I am, traffic permitting! Good guys, just wish some of the Indies I've visited would take a leaf out of their book re how to treat paying customers! As you say they are great guys with superb knowledge. Your car will drive better than when it was new now. Took a load of pics while I was there, when I get a minute will upload! Sounds awesome Rob. I’ll bet it’s better that a new one now. It almost feels like a new car Kev, will certainly be making a visit there maybe every other year for a health check, has brought it home to me how much of a difference small adjustments can make and how important it is on a performance car. You just don’t notice the deterioration over a period of time! Took the car out for a good blast yesterday, it is definitely quieter than before, much less road noise, which is strange as the standard PASM struts have a thick squidgy buffer between the spring and the top mount! The Ohlins just has an aluminium spacer! I also installed the Ohlins last season. It‘s really worth the money. Could you please give some details about your settings front/rear? I‘m currently at 15 clicks both. Would also be interested in your geo settings. I guess, this can be improoved on mine. 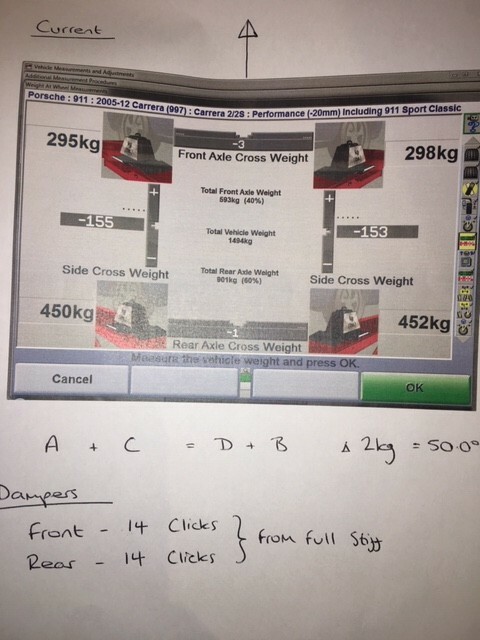 A good alignment centre should be able to get close to these settings if your ride height is similar. Thanks for this info, very interesting - I'd love to get my sus done similarly at some point in the mid term! Perhaps K&W though. Question - the front coffin / control arms, did you just use standard OEM coffin arms, and if so are they good (CG approved!) for such a set up and drop (think you ended up about -2 . I need to get one of my coffin arms done soon, but don't want to fork out over £400 if the part would need to be swapped again if I upgrade and lower the suspension. For example if a gt3 part was needed for this...? Also, has anyone used TRW control arms? I don't mind paying for quality, but I don't just pay blindly for OEM! Thanks for any assistance guys! The TRW arms are OEM. 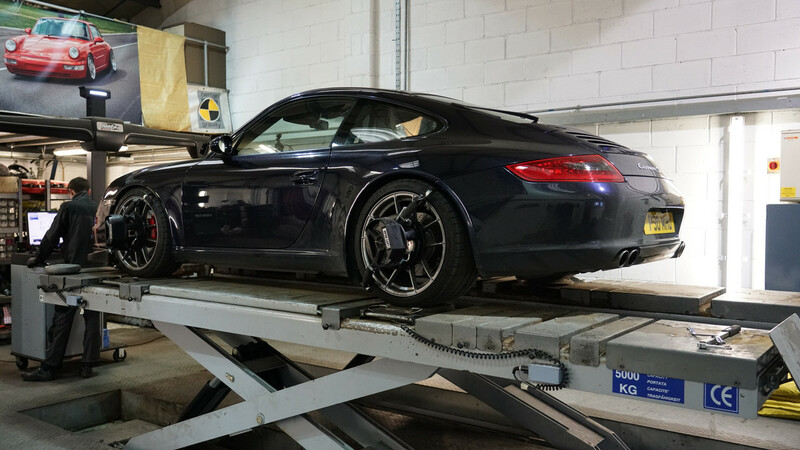 - TRW manufacture the parts for Porsche. If your changing your coffins arms do so in a pair. To get -0.5 degrees on the front this can easily be achieved with the standard control arms by moving the top mounts in the slots. If you want -2 degrees, which unless your tracking the car regularly is not required, you would ideally need 2 piece GT3 lower control arms. I used Meyle parts mostly, I had a good chat with CG before ordering the parts as I was initially looking at the Spyderperformance deal on eBay, for all lower control arms and tuning forks, I didn't go this route in the end due to some concerns around the Powerflex bushes and the fit in the arms that other forum members had raised on here. CG were perfectly happy with Meyle components. Think you are right, TRW make the OEM parts for Porsche, they also make the inner and outer track rods! All these control arms come with the bushings and ball joints fitted. 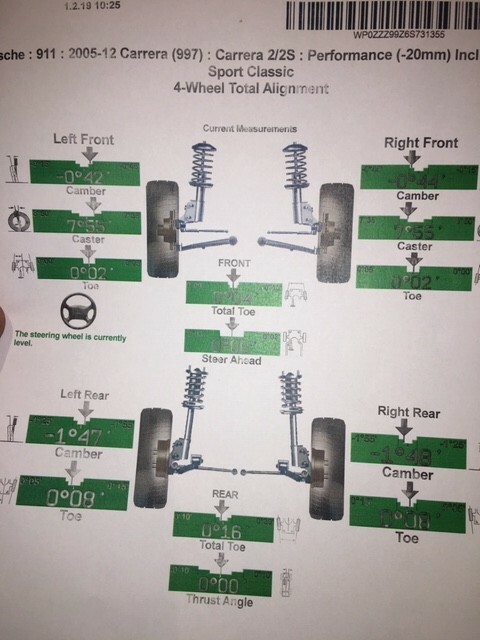 Note, the link you have posted is a rear control arm, the fronts have a different bush. I would imagine that most garages would reccomend the so called OEM parts as they would probably make more profit by supplying them! Whichever way you go, worth a chat with CG, for what I wanted the Ohlins are perfect, if you plan to do a lot of track work then KW might be worth considering as well as a different geo set-up!